Coming Soon: A Wireless EV Highway Charging System? Stanford University researchers this week announced they have designed a road-based, high-efficiency wireless charging system for electric vehicles. In theory, the system could help create a network of all-electric highways that charge electric cars and trucks while they drive, reduce the need for point-specific charging infrastructure, and eliminate range anxiety. The power transfer system is based on a technology called magnetic resonance coupling. 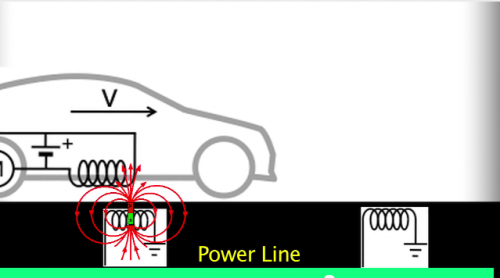 This technology creates a magnetic field between the road and vehicle to transfer electric currents to the vehicle’s battery. Copper coils, placed under the road surface at regular intervals, are tuned to resonate at the same frequency. When an electric current is introduced, it creates a magnetic field between the coils that can then transfer energy to a receiving coil in passing electric vehicles. While the theory may sound far-fetched, it was demonstrated in 2007 by researchers at the Massachusetts Institute of Technology (MIT) who used it to light a 60-watt bulb. Energy was transferred between two coils six feet apart even when humans and other objects were in the way. That team of researchers created a spinoff company to use their technology to develop a stationary charging system that can wirelessly transfer electricity from transmitters to devices, including parked electric vehicles. Inspired by the stationary charging breakthrough, the Stanford team were challenged to increase the amount of transmitted electricity to the level required to power a vehicle. They used mathematical simulations to prove that by bending the copper coils at a 90-degree angle and attaching them to a metal plate, up to 10 kilowatts of electricity can be transferred at a 97 percent efficiency rate. The charging system may theoretically work, but much more research and experimentation will be required to demonstrate the technology. Several challenges remain, such as ensuring the remaining 3 percent of electricity is lost as heat and not absorbed by humans as radiation, determining the optimal layout of road transmitters, and identifying how pavement and vehicle metal could reduce efficiency.